After an intense round of talks in Mexico, NAFTA negotiations are set to advance to a third round in Ottawa Sept. 23-27. 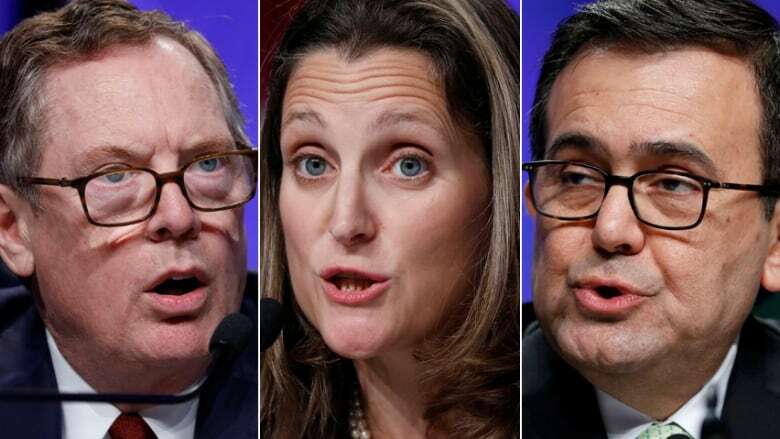 Canada, the U.S. and Mexico closed off an intense round of North American Free Trade Agreement talks today, promising to advance negotiations at a third session in Ottawa later this month. The next session will take place Sept. 23-27, when serious horse-trading is expected to begin, according to an official close to the talks who spoke on condition of anonymity. Speaking after five days of negotiations wrapped up in Mexico City, Foreign Affairs Minister Chrystia Freeland said ongoing discussions will focus on bolstering what works and improving what doesn't to work towards a deal that is win-win-win. "Canada, the U.S. and Mexico all wholeheartedly share the goal of reaching a mutually beneficial agreement," she said. U.S. Trade Representative Robert Lighthizer said talks are moving at a "record pace," and that two dozen chapters have been tabled and discussed. While the goal is to support robust economic growth in all countries, he underscored America's objective of improving parts of the current NAFTA that have bled jobs in some sectors such as manufacturing. "We must have a trade agreement that benefits all Americans, not just some at the expense of others," he said. Insiders have said the second round of discussions in Mexico City broached a wide range of issues, from supply management and auto-parts rules to government procurement, "Buy American" rules and intellectual property. Mexican Secretary of the Economy Ildefonso Guajardo Villarreal echoed hopes for a pact that would be a "victory" for all three countries. "In the process I recognize that we have the responsibility to translate our negotiations into a final result that will imply more jobs in North America, jobs that are well-paid jobs, and to strengthen principles in this continent," he said. Villarreal and Freeland both expressed sympathy for the victims of Hurricane Harvey, and said mutual assistance in times of crisis shows the solid relations between the three countries. Freeland called the response to the disaster by the U.S. "truly impressive." One of the early sticking points in discussions was around professional visas, which is a priority for Canada and for businesses that struggle to send staff across both sides of the border. NAFTA's visa list is outdated and doesn't include modern digital jobs, but the U.S. has pushed off the conversation because it wades in to the country's sensitive immigration politics. Midweek podcast: Is any progress being made on NAFTA? Canada is also pushing for improved labour and environmental provisions as a top priority for a new NAFTA. Canada and the U.S. both want an environment agreement pulled into the main NAFTA papers rather than existing as a side deal. They also want provisions to prevent NAFTA countries from loosening environmental rules as a way to attract investment. Canada and the U.S. differ on climate change. The U.S. is in the process of withdrawing from the the Paris accord on climate change, and U.S. President Donald Trump has previously referred to climate change as a "hoax." He has also started unravelling policies of former president Barack Obama's administration, including fossil fuel production restrictions which Trump says have hurt the U.S. economy. Canada wants a modernized NAFTA to reference climate change and make measures to help combat it a priority.